The cerebellum, also known as the little brain, contains 80% of the brain’s neurons and is essential for day-to-day functioning. It is involved in timekeeping, emotion and motor control and cognition. Although the cerebellum is important for many different brain functions, such as motor control, timekeeping and cognition, it remains a relatively little studied area. Its small size and the very thin and highly folded cerebellar cortex mean that much higher spatial resolutions are necessary to resolve the cerebellar structure than that of the rest of the brain. For example, to separate two of the gray matter layers of the cerebellar cortex, an estimated resolution of ~100 micrometer is required. This is much beyond the current state of the art in MRI. Similarly, cerebellar functional units are small and very close together, separating them requires high spatial resolution and specificity. At the Spinoza Centre, we work on novel high spatial resolution techniques to improve both anatomical and functional cerebellar images. The 7T is employed because of its improved SNR and contrast levels in phase imaging and BOLD sensitive fMRI. Together with researchers at the Netherland Institute of Neuroscience, we investigate the motor system, with special interest in the cerebellum. Data analysis in these projects is strengthened by a collaboration with Pierre-Louis Bazin. 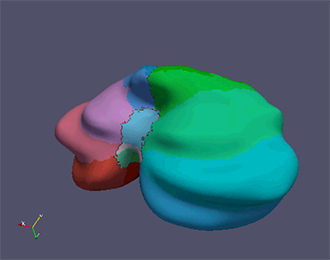 This cerebellar surface was generated in CBStools.